PCs for challenging environments. The specific features are the completely sealed enclosure and the high performance. 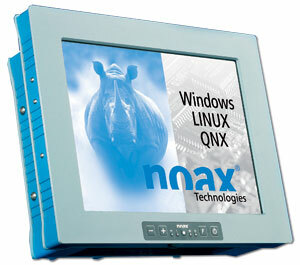 noax PCs are full blown computers which are developed specifically for the requirements of industry. noax industrial computers combine industrial requirements with state of the art computer technology. This allows them to be upgraded at any time and to be compatible with all standard hardware and software systems. It is extremely easy to integrate noax PCs into an existing IT system. The noax Compact Series touch panel PCs have very robust and impact proof aluminum enclosures. The compact, robust and completely sealed construction allows all kinds of applications in extreme environments. Applications range from data acquisition of operating data, machine data and time and attendance to machine control and process visualization. Another wide area of applications is in the mobile IT field such as in Warehousing/Logistics and for the construction business with certain mobile equipment such as cranes, etc. The compact series is available with 8.4/12.1/15 inch display sizes.